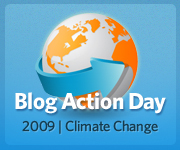 What is blog action day you ask? Its a group of bloggers who come together to send a message to everyone including the president of the united sates about the climate & ways we can conserve due to the recent climate change. I personally only host with green hosting witch is Host Gator I also help out within my community use energy efficient products. What do you do to help out ?